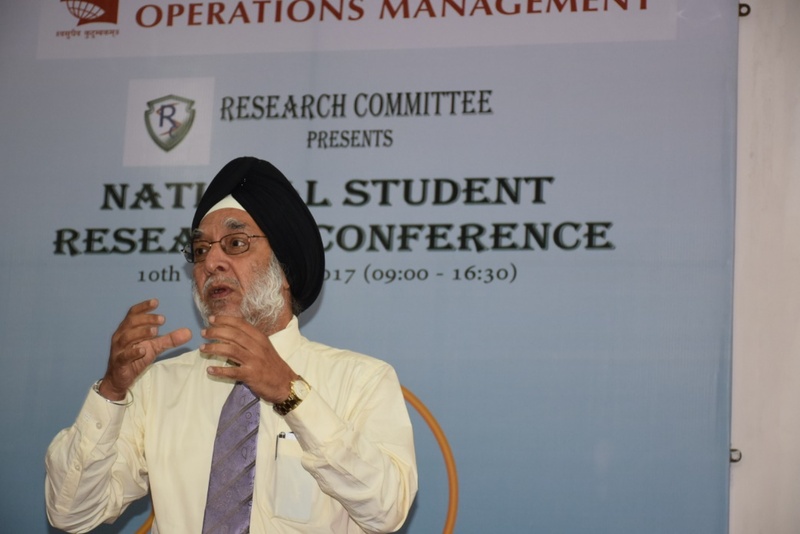 NSRC 2017 a one full day National conference on 'Operations and Supply Chain Management'. 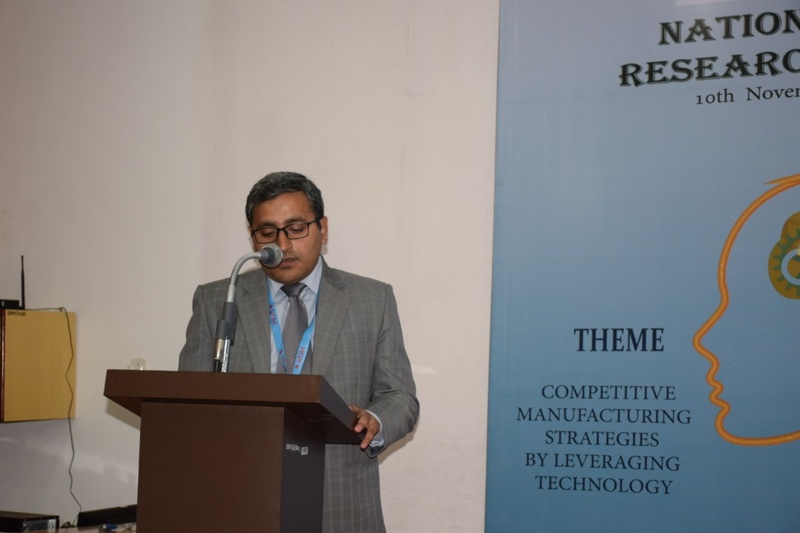 The theme for the conference was ‘Competitive Manufacturing Strategies by Leveraging Technology'. 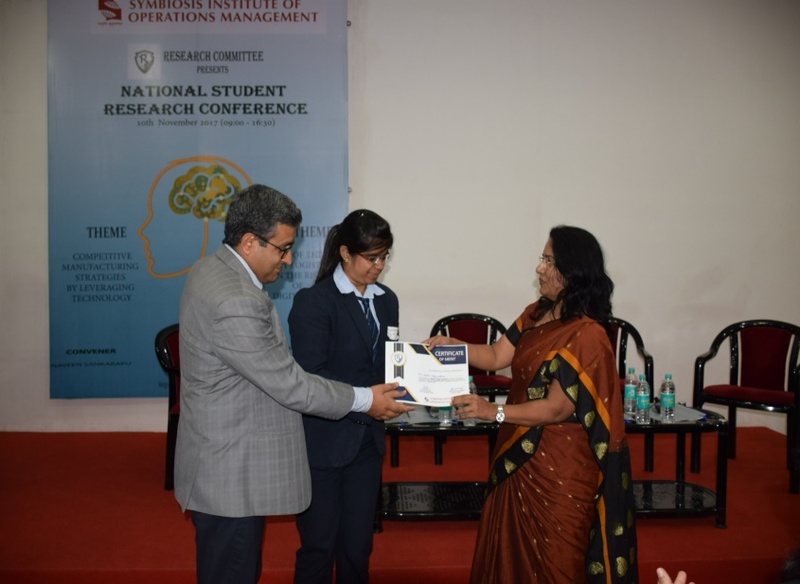 Students from different colleges participated in the conference and as many as 17 research papers were presented in the one-day session i.e. November 2017. 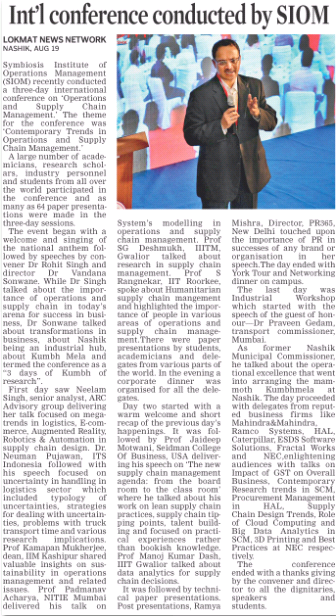 The event began with a welcome and singing of the national anthem followed by speech by convener Dr Sachin Modgil about the importance of Manufacturing Strategies by Leveraging Technology in today's arena for success in business. 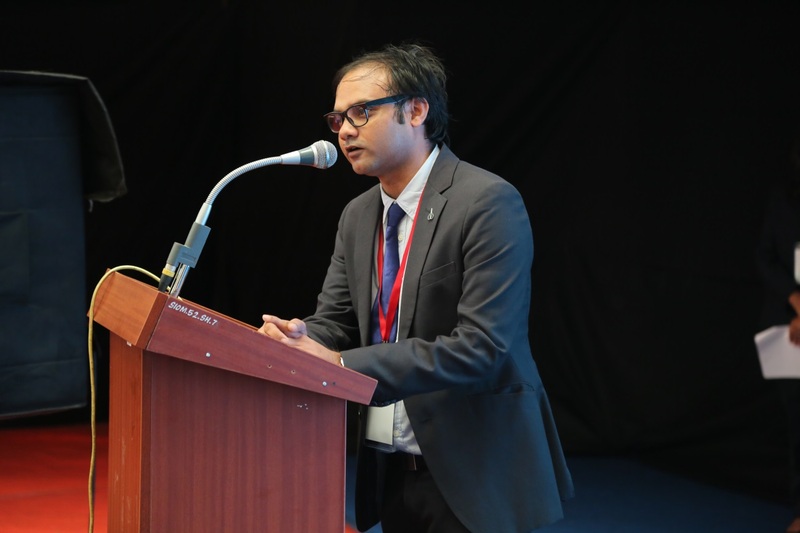 First speech was by Dr.Joginder Lamba, Professor and Head Operations and SCM Department, K. J. Somaiya Institute of Management Studies and Research College delivering his talk focused on Risk Management in Supply Chain. 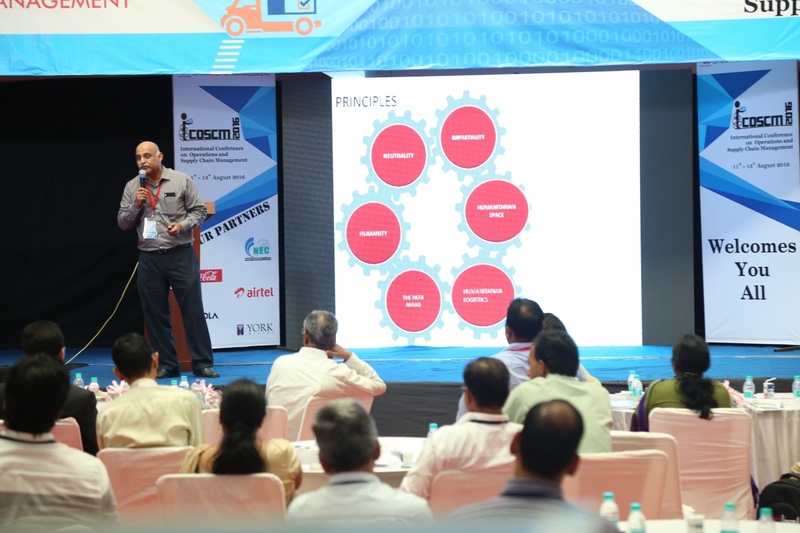 Next presentation was followed by Dr.P.J.Pawar, K. K. Wagh Institute of Engineering Education & Research on optimization of supply chain. 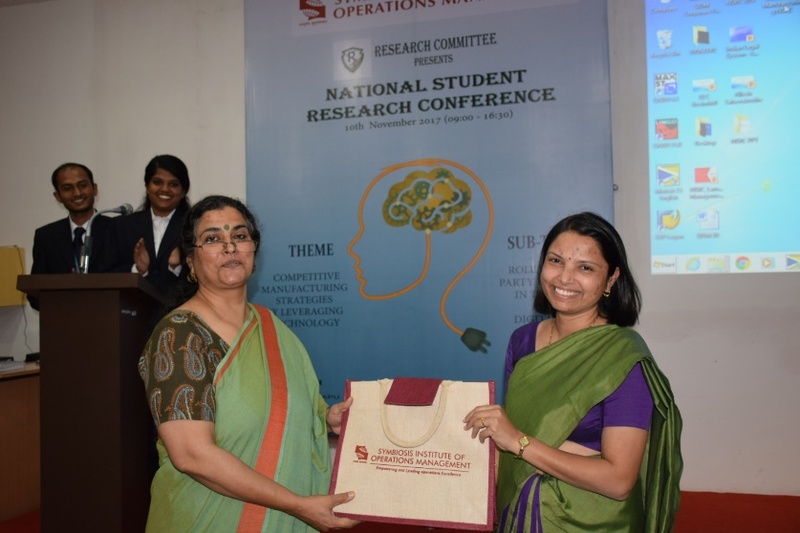 There were paper presentations by students, academicians from different colleges. It was followed by technical paper presentations. Student from different colleges presented paper on Research/Summer Internship project that was done in the past. 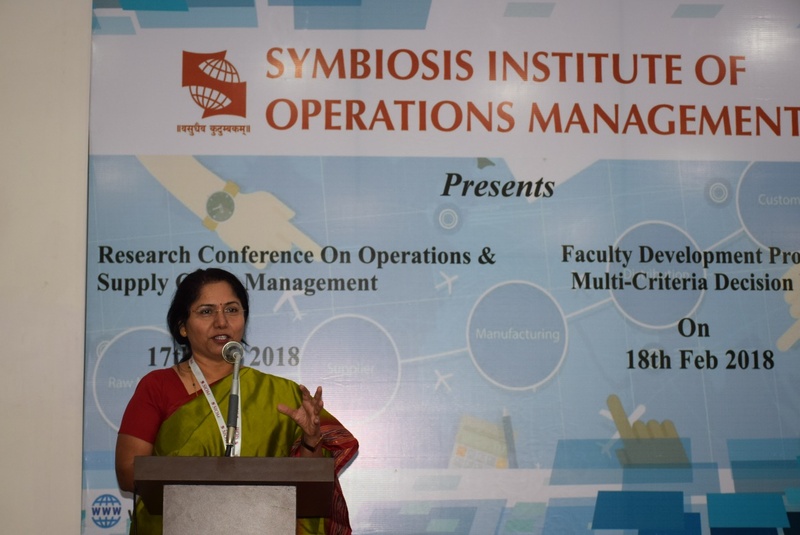 Post lunch session was started by Key note speaker presentation by Dr. Aasha Sharma, Symbiosis Institute of Operations Management, Faculty in Marketing about Sustainability in Manufacturing. It was followed by technical paper presentations. Next event for the day is panel discussion by Dr. Shilpa Parkhi,Dr. Aditi Mishal, Dr. Ratna Paluri, Prof. Prashant and Prof. Rishabh Jain acting as a Moderator for the discussion on ‘Make in India Challenges- Vision 2030’. The conference ended with a thanks giving by the student conveners and prize distribution by director to all the winners. Dr. Sachin Modgil opening the conference by delivering Welcome note to all the esteemed guests, delegates and students of SIOM. Dr.Joginder Lamba, Professor and Head Operations and SCM Department from K. J. Somaiya Institute of Management Studies and Research enlighting us on Risk Management in Supply Chain. 2 Sharwari Waghmare Sandip institute of technology and research centre Statistical quality control as a strategic competitive advantage. Dr Avdhoot Pol SIBAR, Kondhwa Millennial’s awareness about Industry 4.0 and critical study of readiness of millennial for employability opportunity with the industries belongs to Industry 4.0 with respect to Indian Context. 12 Kirti Rajpal Symbiosis Institute of Operations Management, Nashik Profit and Loss Analysis on Energy Project Deployment at Indus Towers Ltd. Details of Abstract Publication: The accepted abstracts are published in ISBN numbered proceeding. ISBN– 978-93-86724-17-5. 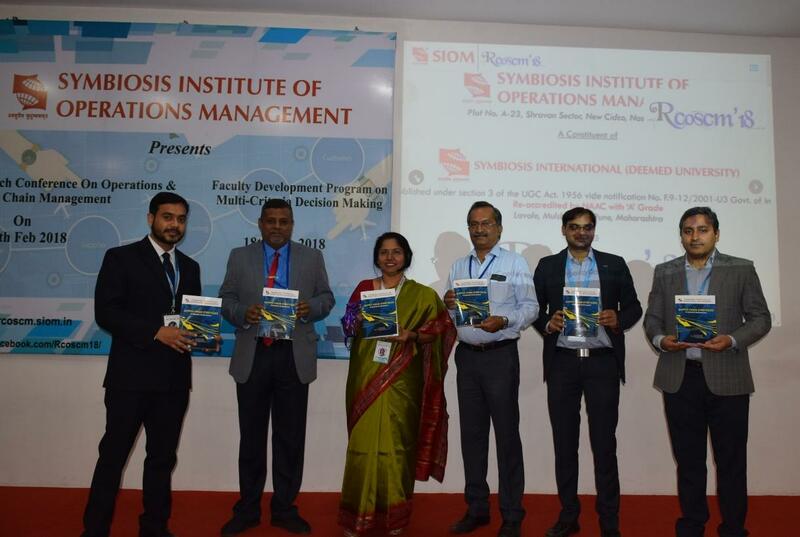 This proceeding is published by Excel India Publishers, New Delhi for Symbiosis Institute of Operations Management. 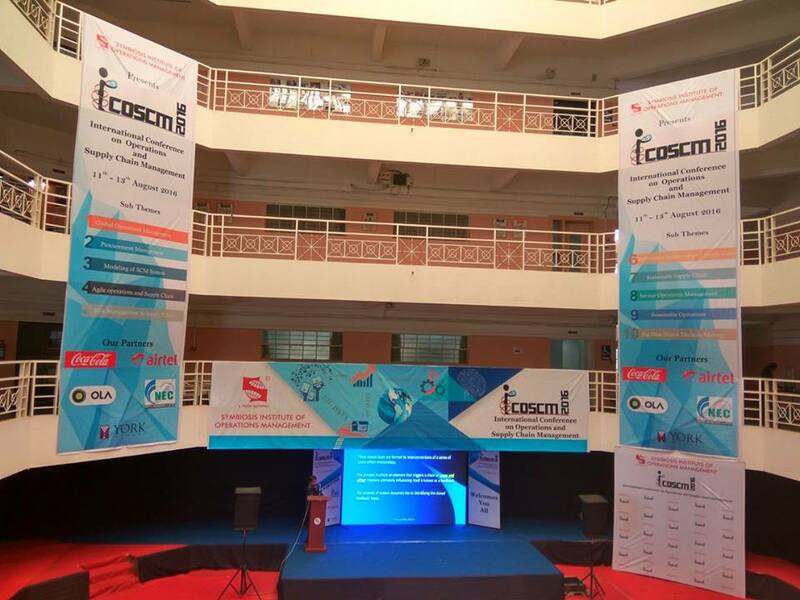 COSCM 2016 a three-day international conference on 'Operations and Supply Chain Management.' 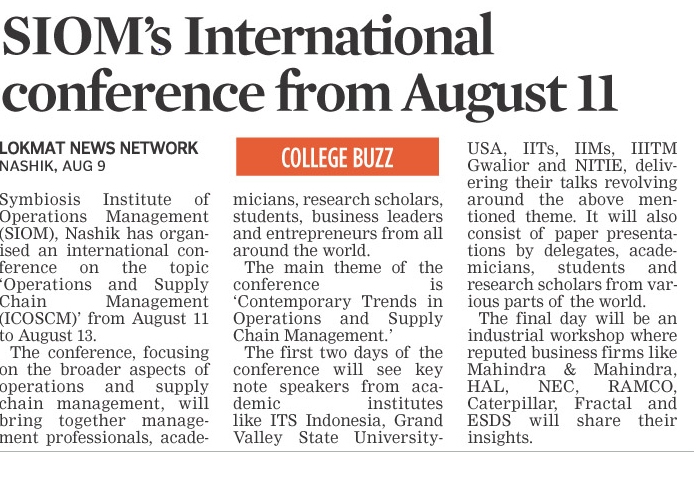 The theme for the conference was 'Contemporary Trends in Operations and Supply Chain Management.' 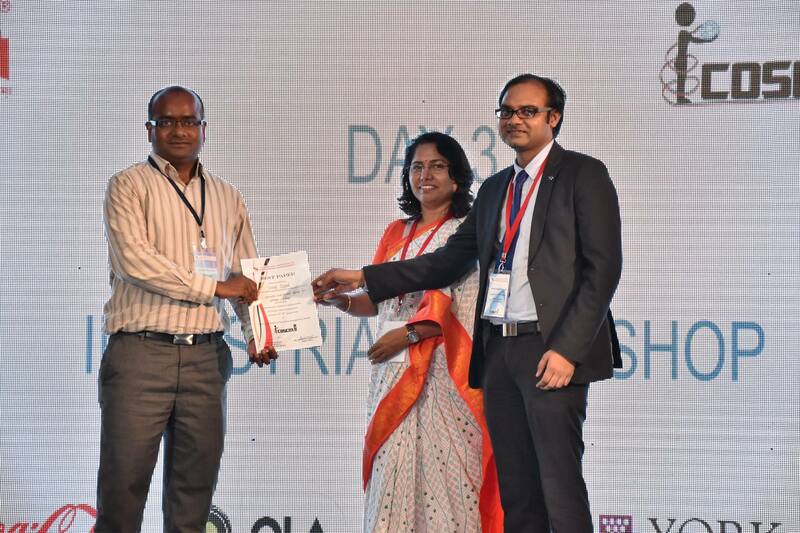 A large number of academicians, research scholars, industry personnel and students from all over the world participated in the conference and as many as 64 research papers were presented in the two-day sessions i.e. 11th & 12th Aug 2016. The event began with a welcome and singing of the national anthem followed by speeches by convener Dr Rohit Singh and director Dr Vandana Sonwaney. Dr Rlohit Singh talked about the importance of operations and supply chain in today's arena for success in business, Dr Sonwaney talked about transformations in business, about Nashik being an industrial hub. 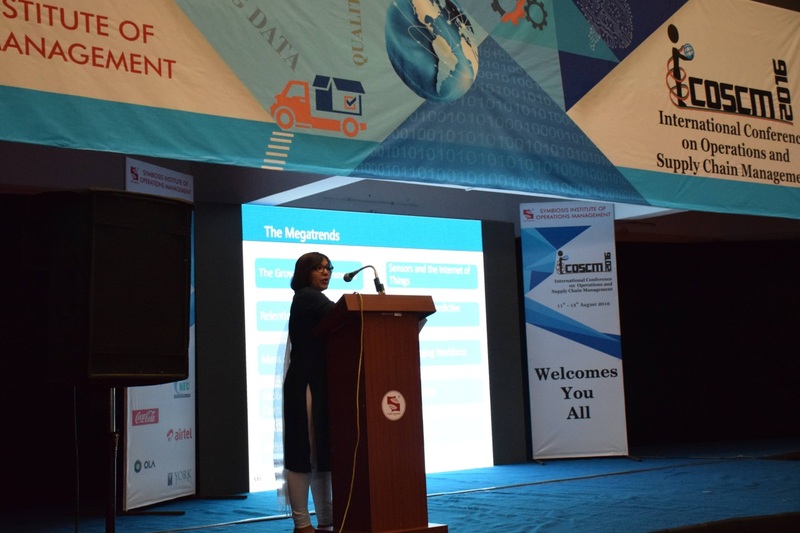 First day saw Neelam Singh, senior analyst, ARC Advisory group delivering her talk focused on megatrends in logistics, E-commerce, Augmented Reality, and Robotics & Automation in supply chain design. 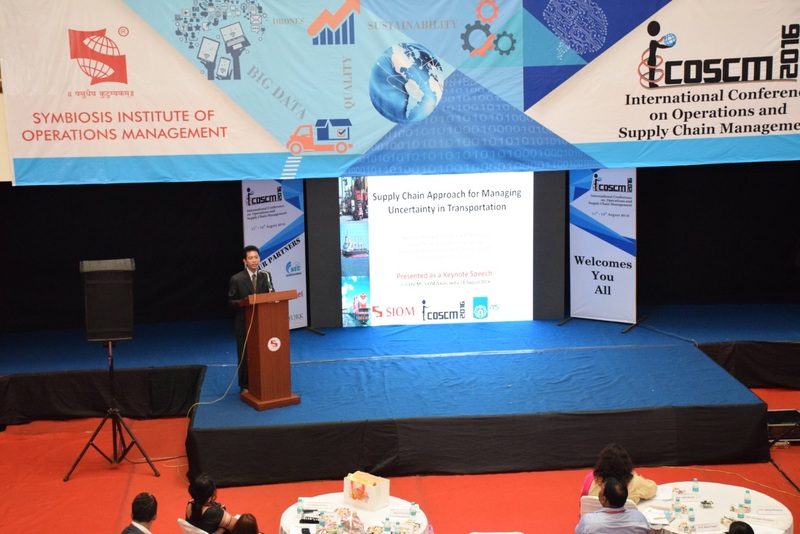 Dr. Nyoman Pujawan, ITS Indonesia followed with his speech focused on uncertainty in handling in logistics sector which included typology of uncertainties, strategies for dealing with uncertainties, problems with truck transport time and various research implications. Prof Kamapan Mukherjee, dean, IIM Kashipur shared valuable insights on sustainability in operations management and related issues. 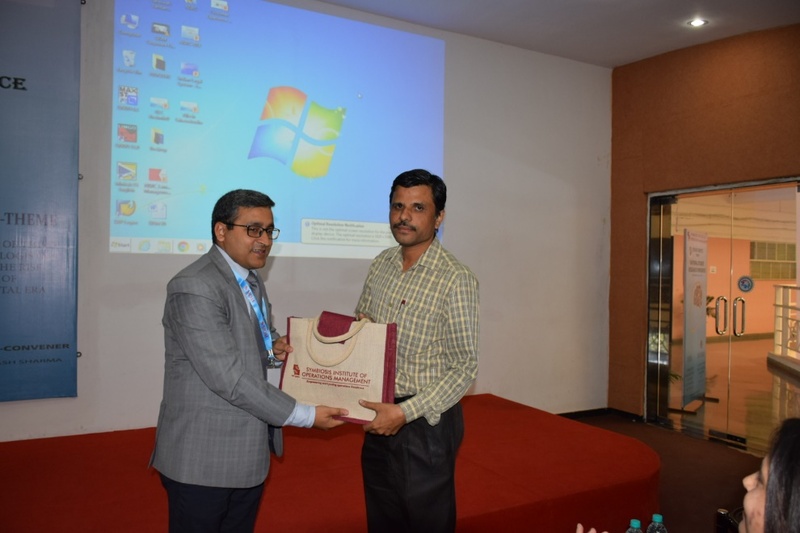 Prof Padmanav Acharya, NITIE Mumbai delivered his talk on System's modelling in operations and supply chain management. 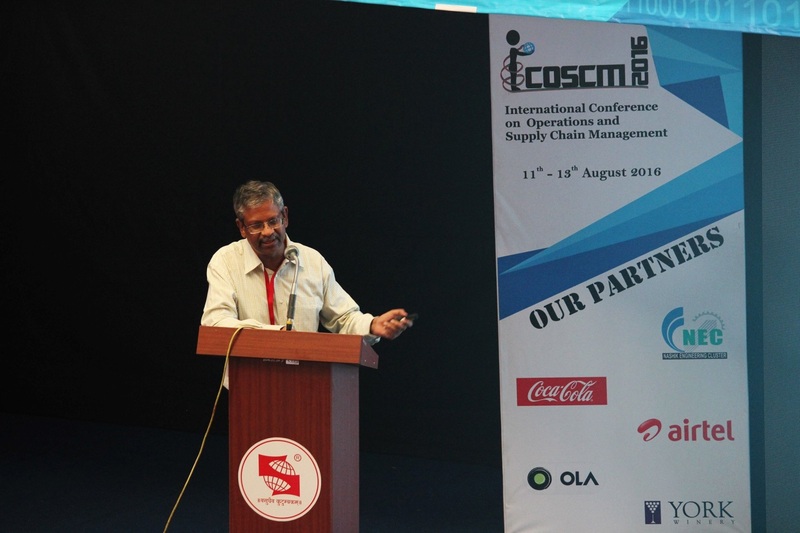 Prof S G Deshmukh, IIITM, Gwalior talked about research in supply chain management. 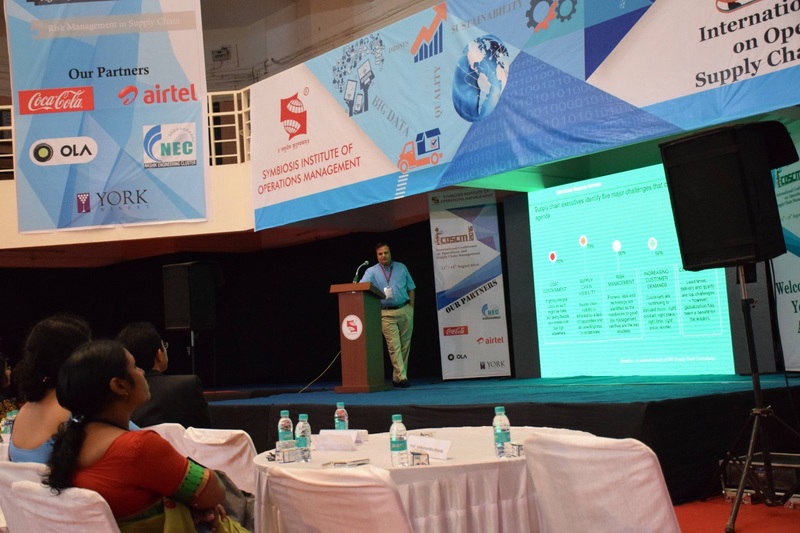 Prof S Rangnekar, IIT Roorkee, spoke about Humanitarian supply chain management and highlighted the importance of people in various areas of operations and supply chain management. 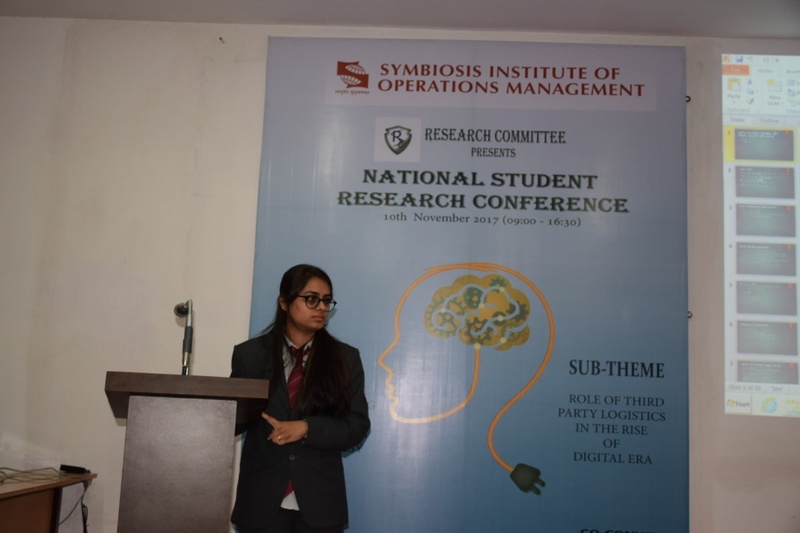 There were paper presentations by students, academicians and delegates round the globe. In the evening a corporate dinner was organised for all the delegates. Day two started with a warm welcome and short recap of the previous day's happenings. It was followed by Prof Jaideep Motwani, Seidman College Of Business, USA delivering his speech on 'The new supply chain management agenda: from the board room to the class room' where he talked about his work on lean supply chain practices, supply chain tipping points, talent building and focused on practical experiences rather than bookish knowledge. 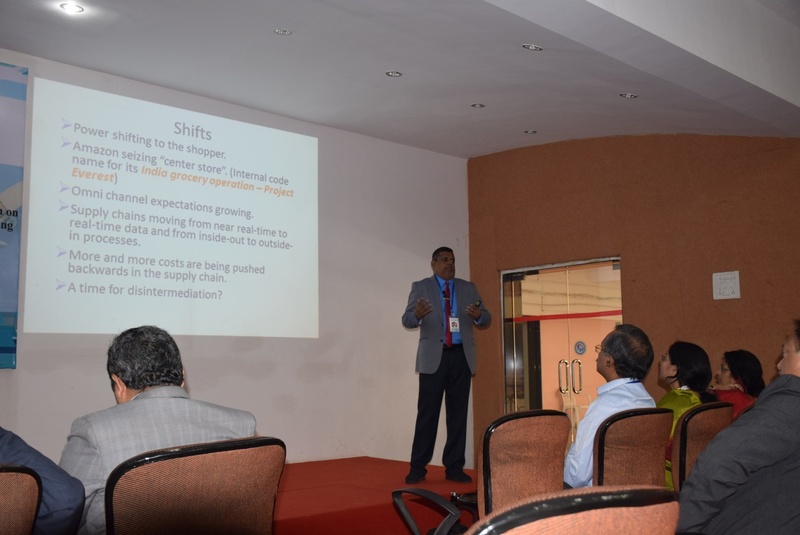 Prof Manoj Kumar Dash, IIIT Gwalior talked about data analytics for supply chain decisions. It was followed by technical paper presentations. Post presentations, Ramya Mishra, Director, PR365 touched upon the importance of PR in successes of any brand or organisation in her speech.The day ended with York Tour and Networking dinner on campus. The last day was Industrial Workshop which started with the speech of the guest of honour—Dr Praveen Gedam, transport commissioner, Mumbai. 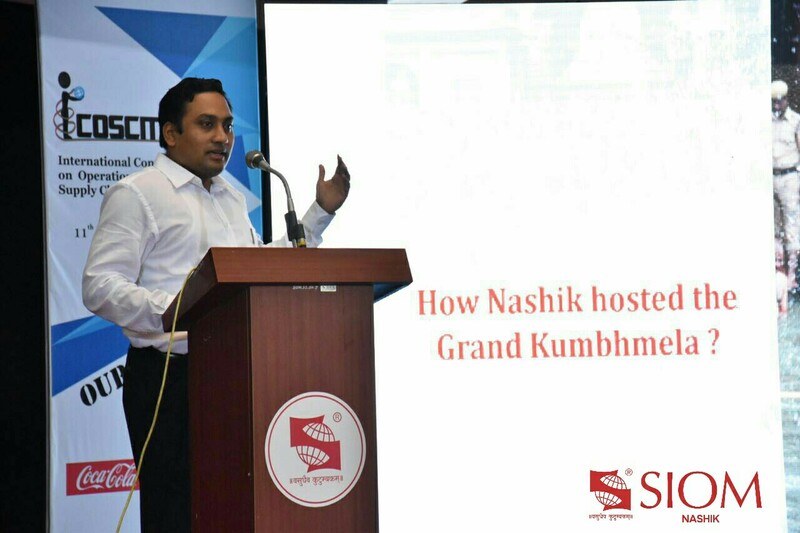 As former Nashik Municipal Commissioner, he talked about the operational excellence that went into arranging the mammoth Kumbhmela at Nashik. The day proceeded with delegates from reputed business firms like Mahindra & Mahindra, Ramco Systems, HAL, Caterpillar, ESDS Software Solutions, Fractal Works and NEC, enlightening audiences with talks on Impact of GST on Overall Business, Contemporary Research trends in SCM, Procurement Management in HAL, Supply Chain Design Trends, Role of Cloud Computing and Big Data Analytics in SCM, 3D Printing and Best Practices at NEC respectively.The conference ended with a thanks giving by the convener and director to all the dignitaries, speakers and students. 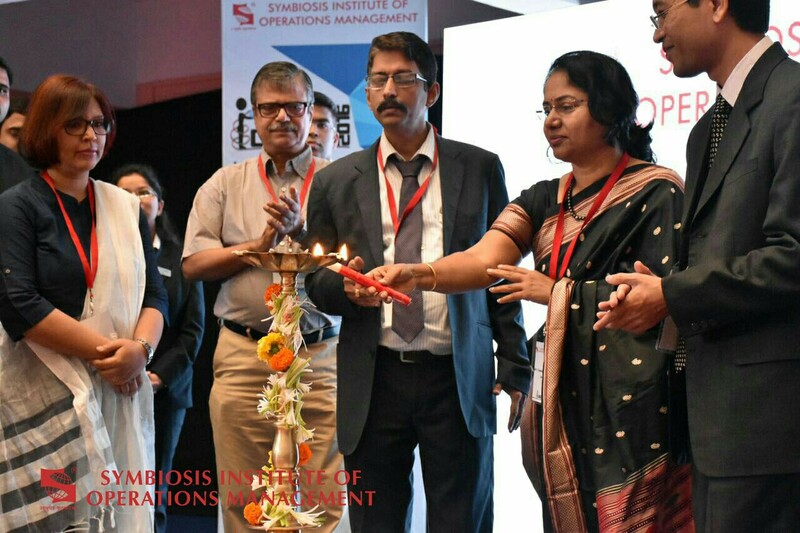 Dr. Vandana Sonwaney opening up the conference to all the esteemed guests, delegates and students of SIOM. Ms.Neelam Singh, Senior Consultant from ARC Advisory Group enlighting us on Megatrends Reshaping Logistics. 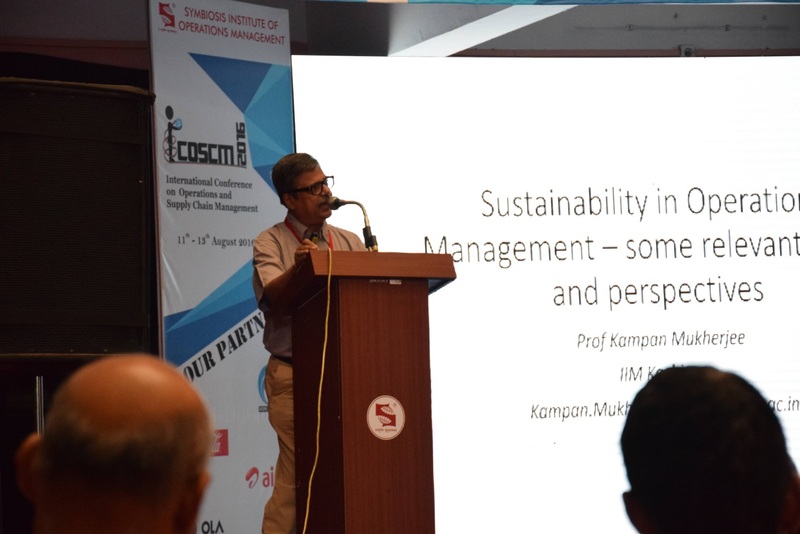 Prof.Kampan Mukherjee, Dean, IIM Kashipur talks about some issues and perspectives of Sustainability in Operations Management. 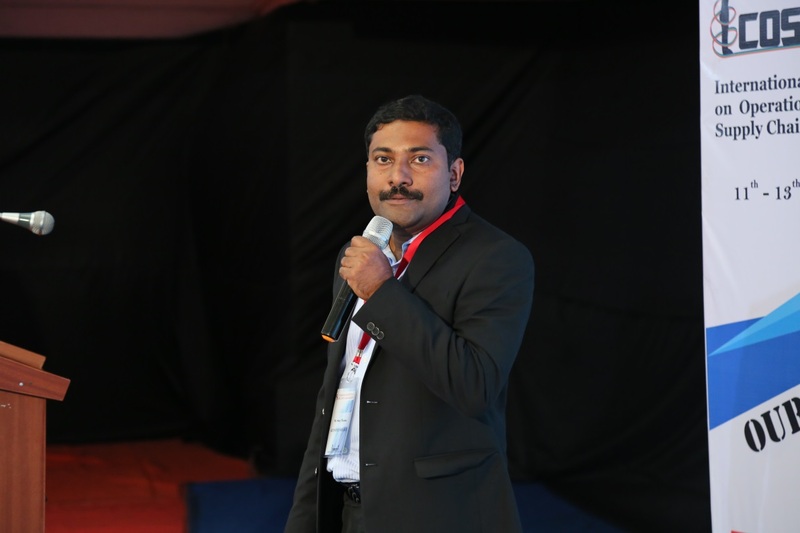 Our Keynote Prof.Padmanav Acharya from NITIE, Mumbai. Our Keynote Prof. S. G. Deshmukh, Director- IIIT Gwalior. Our guest of honour today - Dr. Praveen Gedam, Transport Commissioner of Mumbai. Ex Municipal Commissioner of Nasik - Dr. Praveen Gedam shares his experience during Nasik Kumbh. 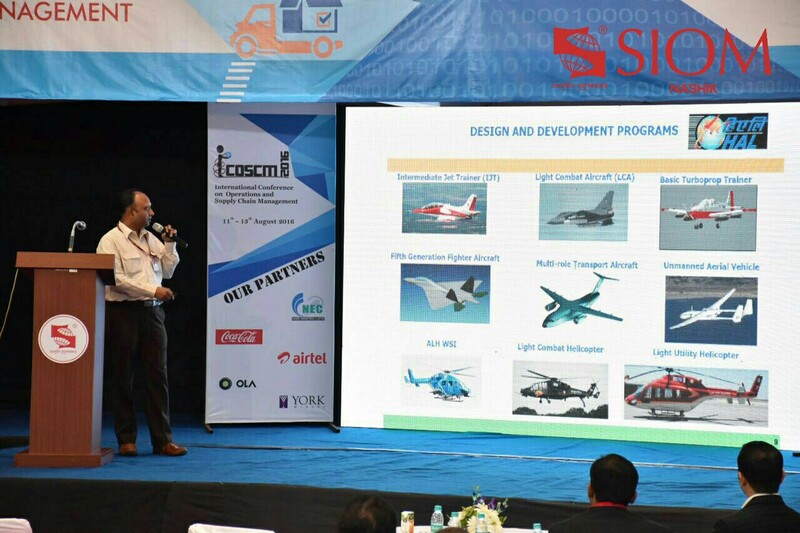 Keynote speaker - Mr.Ravindra Kumar, Deputy General Manager - Hindustan Aeronautics Limited spoke to us about Procurement Management in HAL. 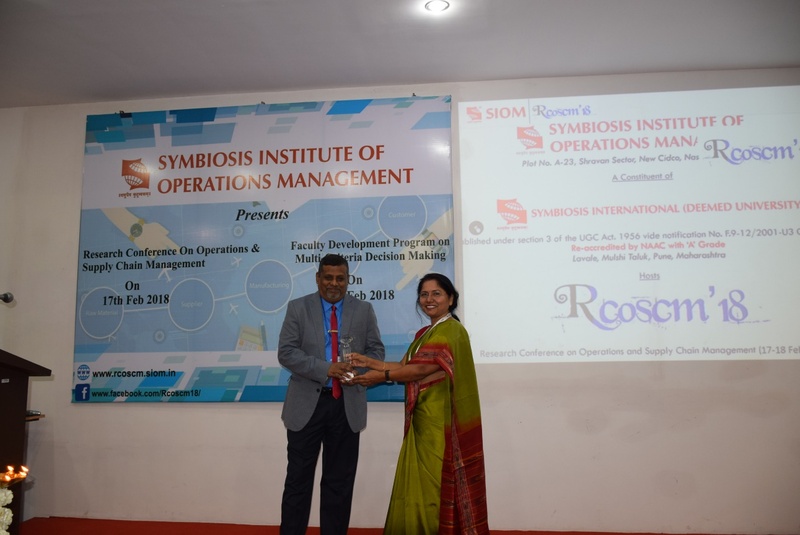 Symbiosis Institute of Operations Management signs anMoU with Nashik Engineering Cluster for the technical development of the students and add to the operational environment. 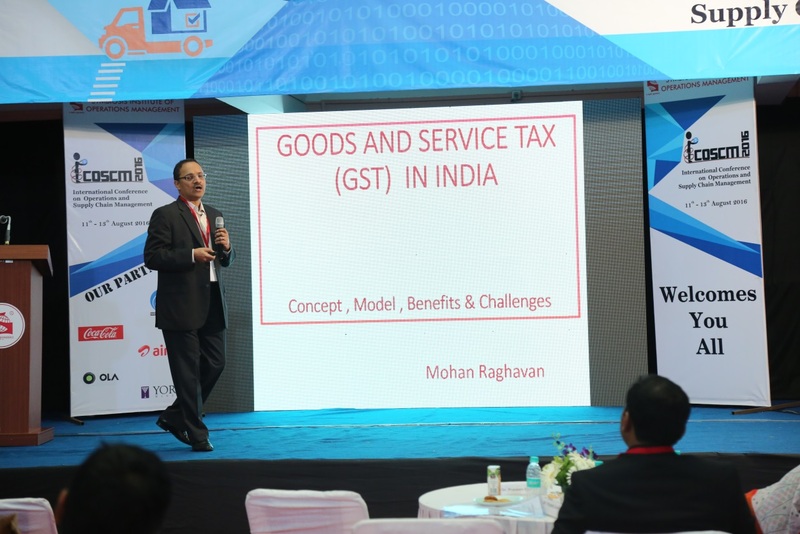 Mr. Mohan Raghavan, Senior Vice President - Mahindra and Mahindra spoke to us regarding GST and new challenges for the industry. 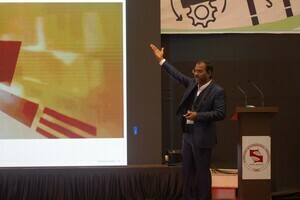 Mr. Sony Thomas, Distribution Consultant at Caterpillar Supply Chain and Analytics shared his insights about new trends in Supply Chain Design. 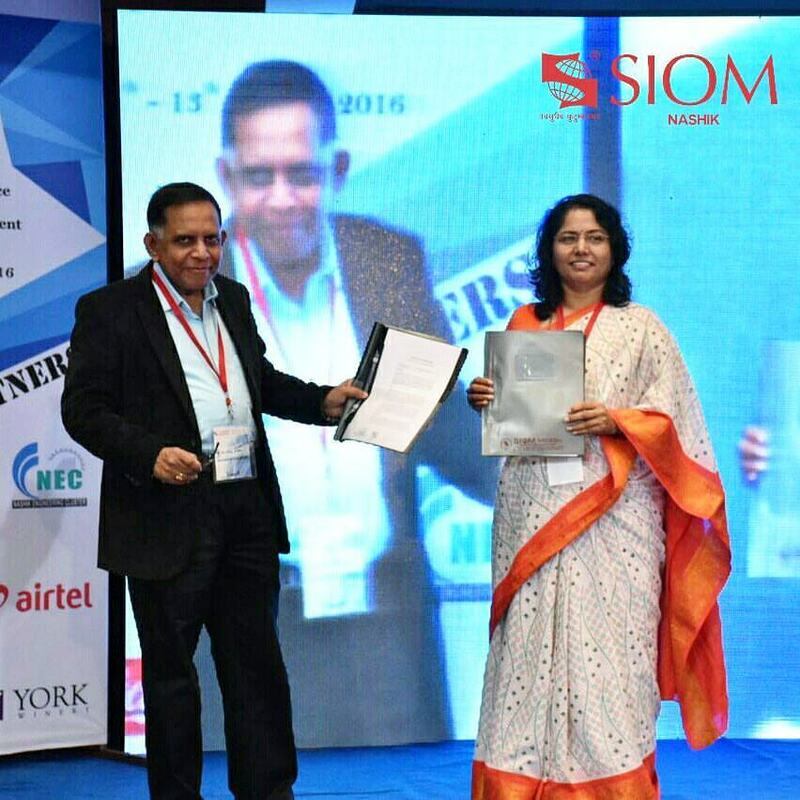 Runners Up for the paper presentation at ICOSCM 2016. 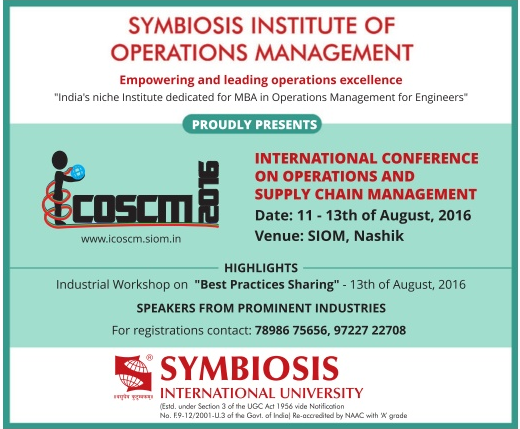 ChetanSaxena and Naman Singh from Symbiosis Institute of Operations Management, Nasik. 46 Karuppanna Prasad N TVSTS Ltd, India A review on the experimental usage of classical, Shanin and Taguchi design of experiment (DOE) with Data Mining approach using six sigma DMAIC. 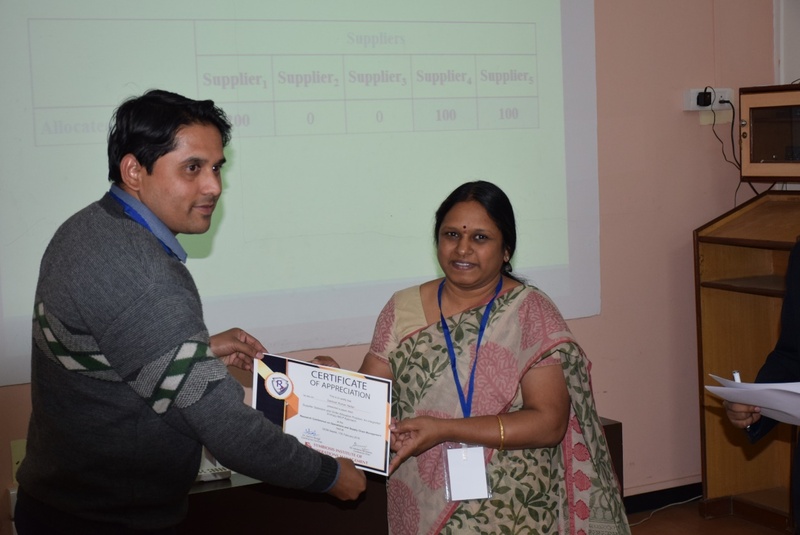 76 Dr. Shilpa Parkhi SIOM Building the foundation for Supply Chain Costing by identifying and prioritizing the elements involved using Topsis. 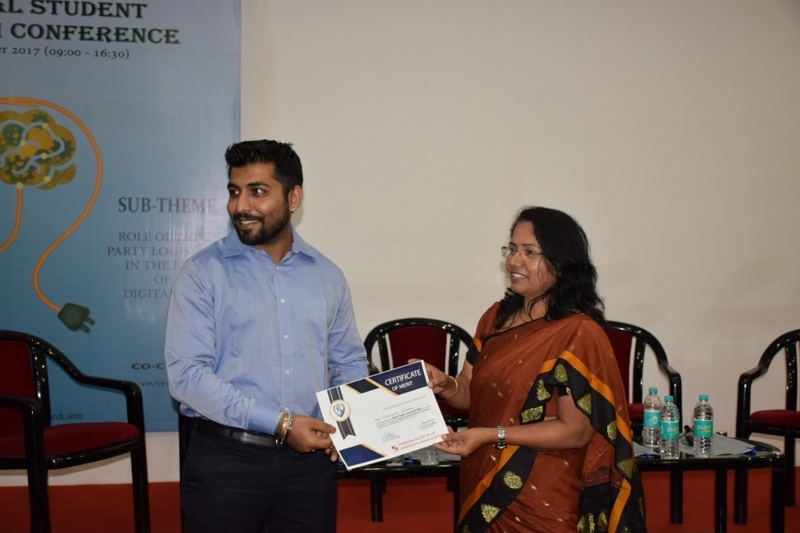 95 Akansha Rammaiya Symbiosis Institute of Operations Management, Nashik Supply chain performance measurement framework for small and medium scale enterprises. 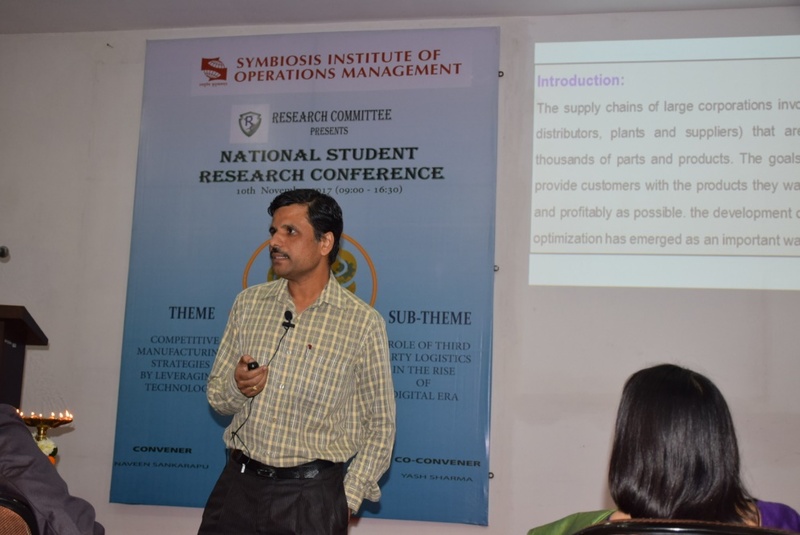 106 Pradeep Kumar Jain Symbiosis Institute of Operations Management, Nashik Risk Analysis in Global Supply Chain Management: Application of AHP and DEMATEL. Research involves poking, prodding and delving into that which sparks our intellectual curiosity. 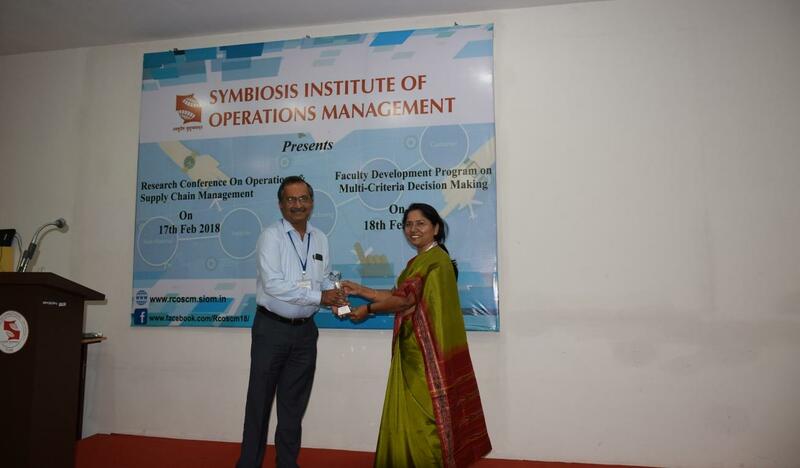 Understanding this, every year Symbiosis Institute of Operations Management organizes an event solely dedicated to those thirsting for academic research. The theme for this year was 'Sustainable Business Development', aimed at understanding the various sustainable principles and practices necessary to protect the needs of the future generations. 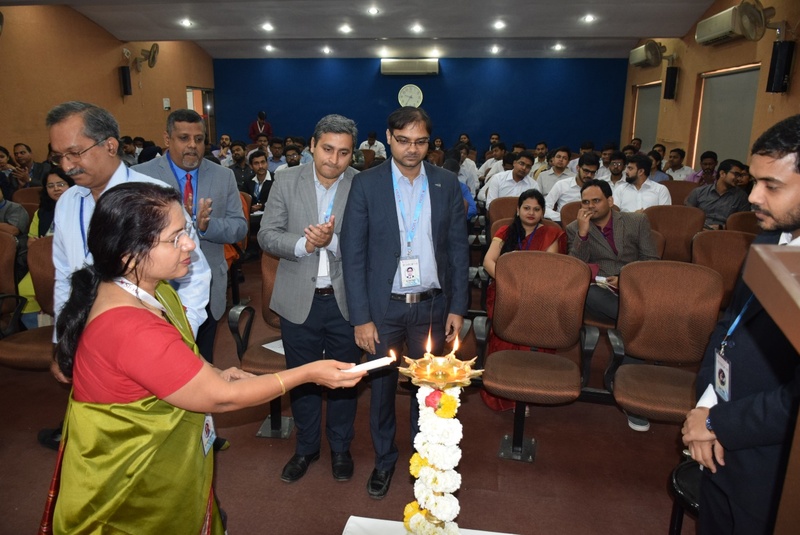 The chief guest for the day , Mr. Sidharath Tuli (Vice President & Head HR, L&T Hydrocarbon) spoke on how safety incidents have a tendency to cascade and a single event can lead to the culmination of many, as explained by Herbert Heinrich's Triangle theory. He explained about how important it is to integrate sustainability into the business plan of an organization. Following this, we had presentations on Sustainable Business development by students, faculty and participants from the industry. The event saw incredible amount of efforts put in by all the participants. Some of the topics presented were Electronic Reverse Auction, Solid Waste Management, Green Supply chain management, Hybrid Electric cars etc. The winners for the event were then awarded certificates and prizes. 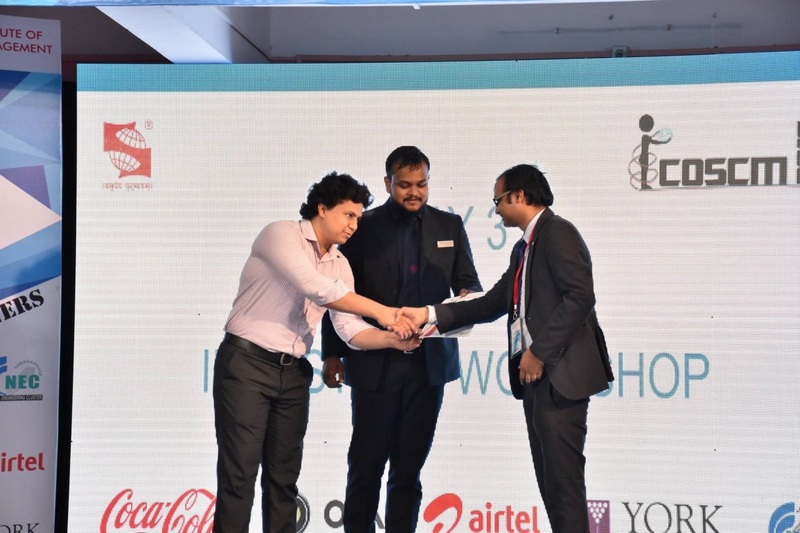 In the student category,Priyabrata Ray and Vinayak Bakshi emerged as winners. 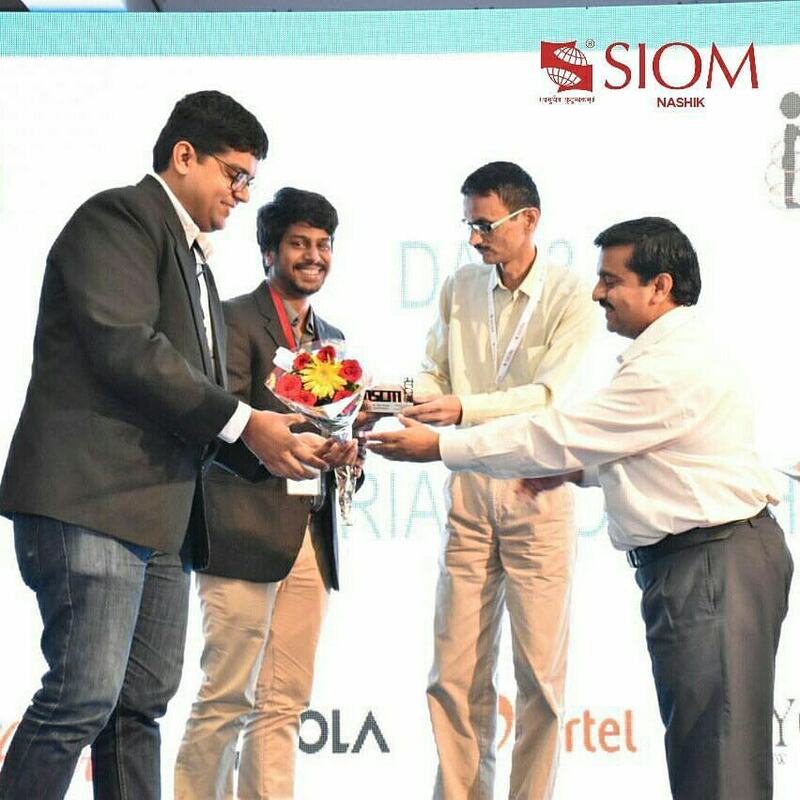 The runners-up were Varun Joshi and Priyank Patil. 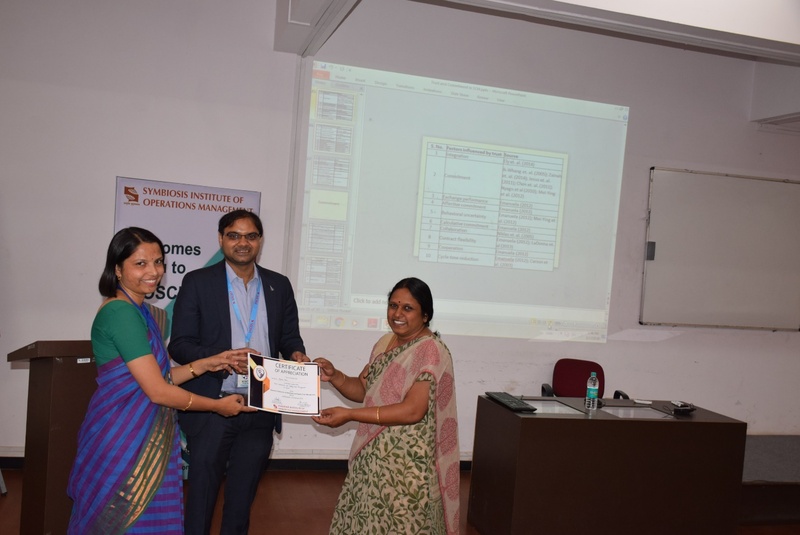 Special appreciation was given to Rutvij Patel for his work on Interpretative Structural Modeling. 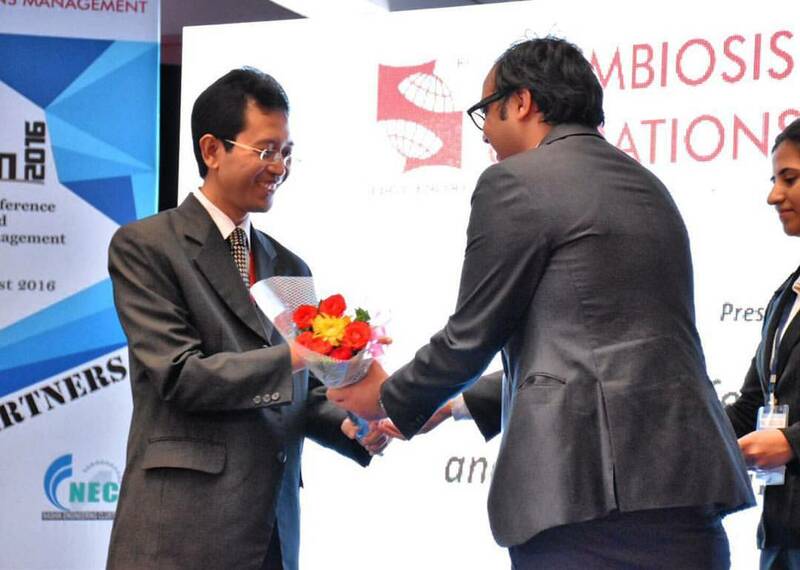 In the faculty and corporate category, the first prize was awarded to Mr. Rajesh Patil, Manager at L&T. 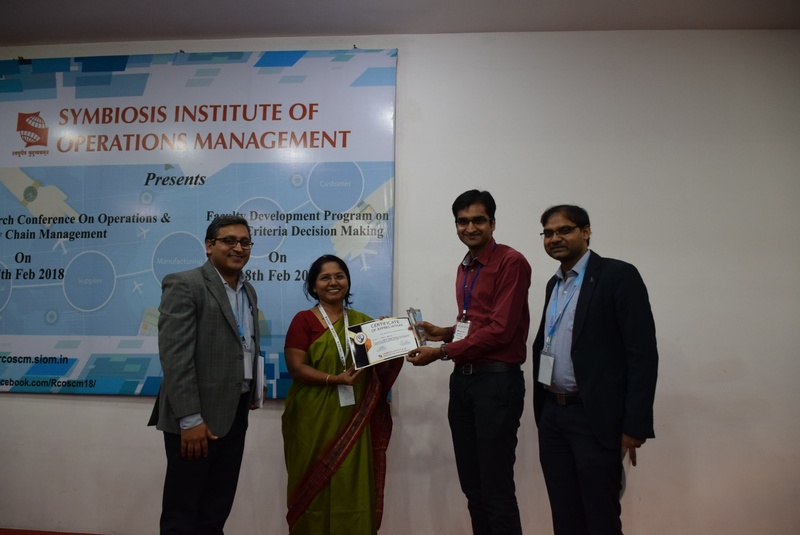 Mr. Shirish Jeble, Assistant Professor at SIBM Pune emerged first runner-up and second runners-up were SIOM faculty Mr.Prashant Barge and Mr. Shreekrishna Patil. Certificates of appreciation were then awarded to all the participants. 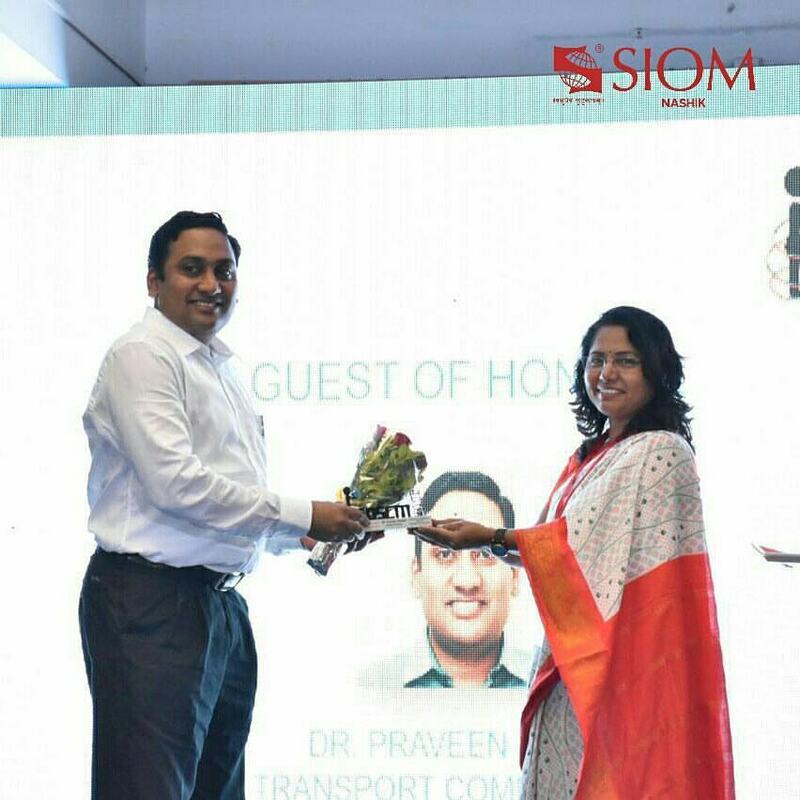 All in all, the day was a wonderful learning experience for the students and faculty of SIOM alike. It was a source of motivation for those students, who aspired to one day try their hand at research. 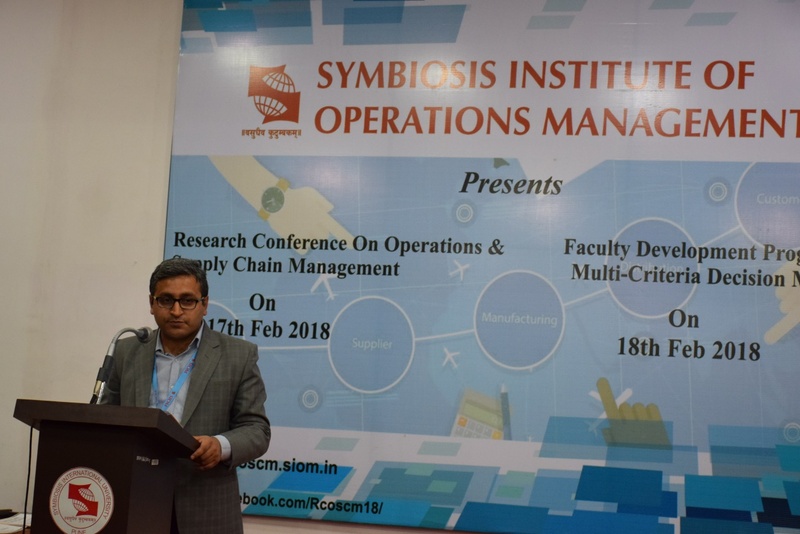 RCOSCM 2018 was a one full day Research conference on 'Operations and Supply Chain Management'. 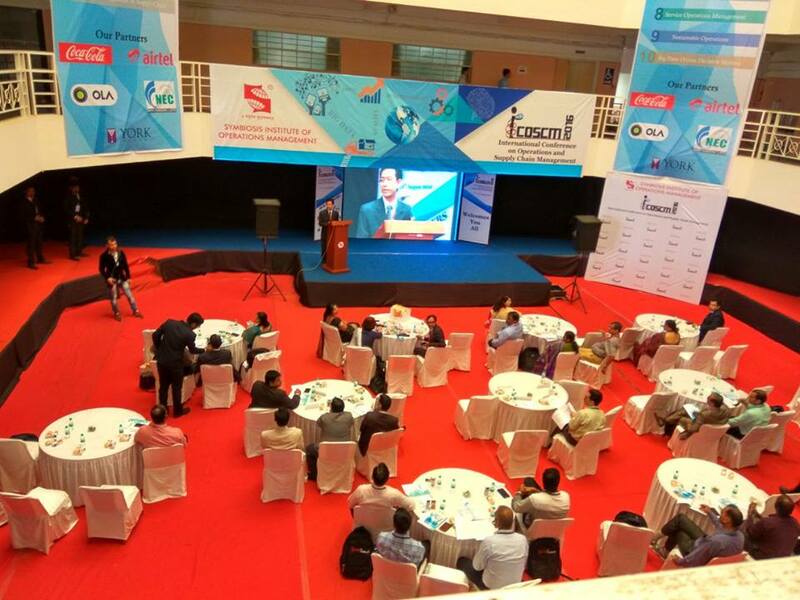 The theme for the conference was ‘Competitive Manufacturing Supply Chain Strategies in Dynamic Environment’. 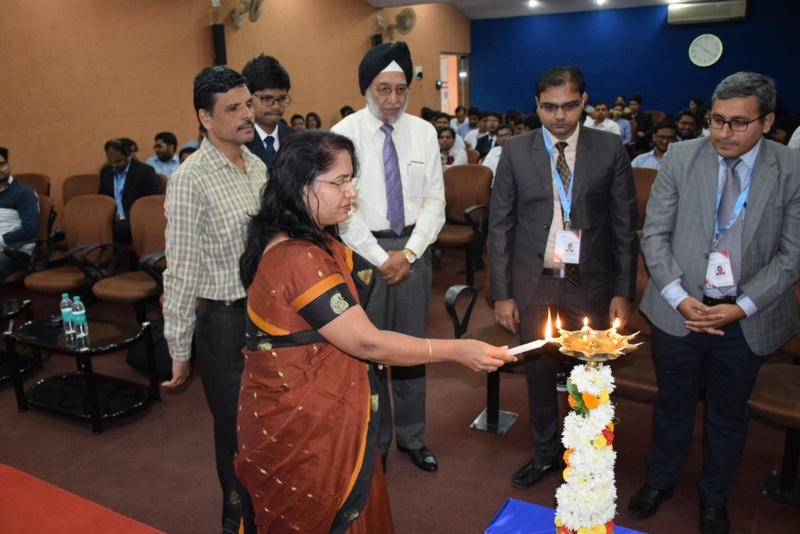 Academicians and Research Scholars from different colleges participated in the conference and as many as 37 research papers were presented in the one-day i.e. 17th Feb 2018. 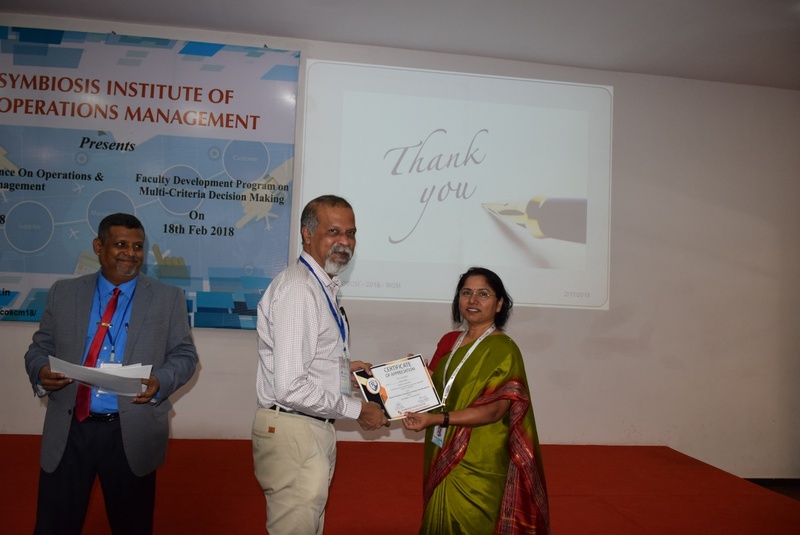 37 papers were presented in 9 parallel sessions, chaired by Dr. Vaidy Jayaraman, Dr. Madhusudanan, Dr. Vandana Sonwaney, Dr. Shilpa Parkhi, Dr. Ratna Paulri, Dr. Aditi Mishal, Dr. Aasha Sharma, Dr. Surendra Kansara, Dr. Rohit Kr. Singh and Dr. Sachin Modgil. The event began with the welcome and lighting of lamp. 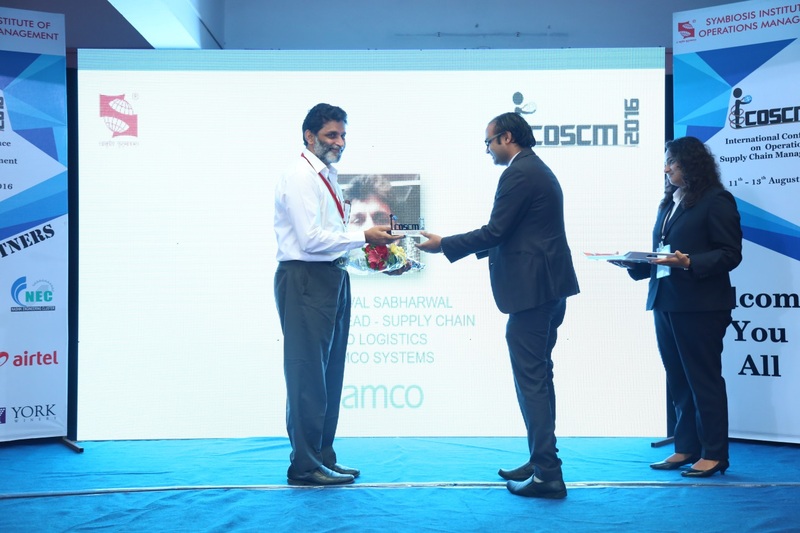 Later the proceedings in edited book form were released and a speech was given by Dr.Vandana Sonwaney about the importance of Competitive Manufacturing Supply Chain Strategies in Dynamic Environment. 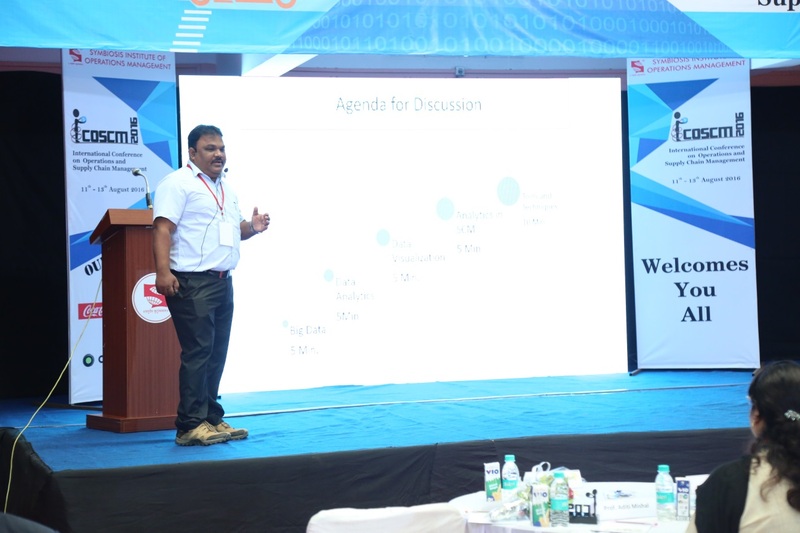 First speech was by Dr. Vaidy Jayaraman, Distinguished Professor, Principal & Associate Dean, Great Lakes Institute of Management, Chennai focusing his talk on “Digital Supply Chain”. Next paper presentations were followed by academicians and research scholars from various institutes all over the country. 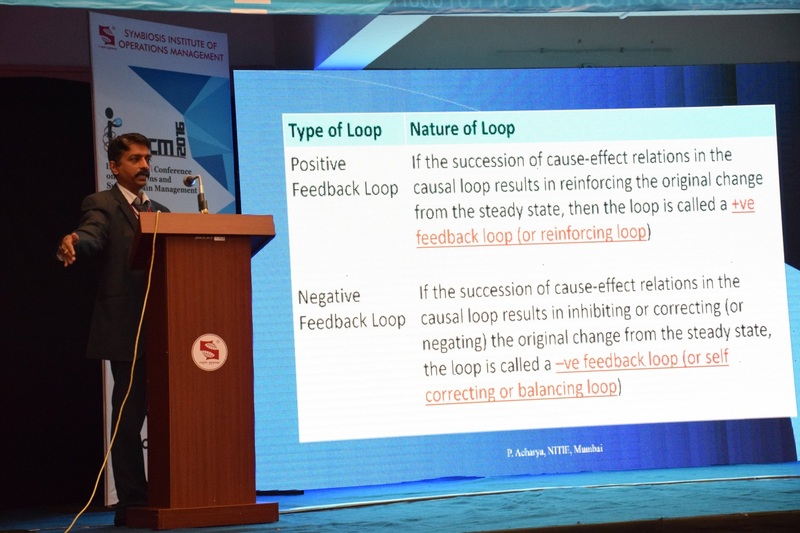 Post lunch session was started by Keynote Dr. V. Madhusudanan Pillai, Head- School of Management Studies National Institute of Technology (NIT) Calicut. It was followed by technical paper presentations. 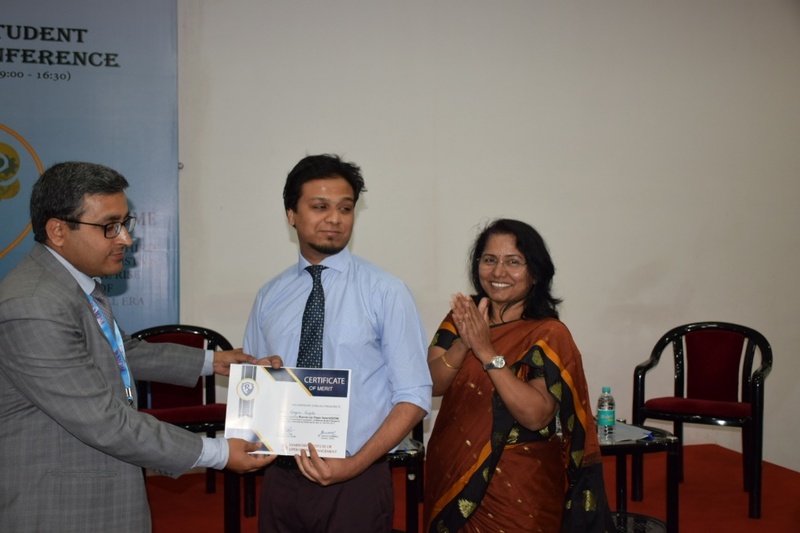 The conference ended with a thanks giving by the faculty convener Dr.Sachin Modgil and prize distribution by director to all the winners. 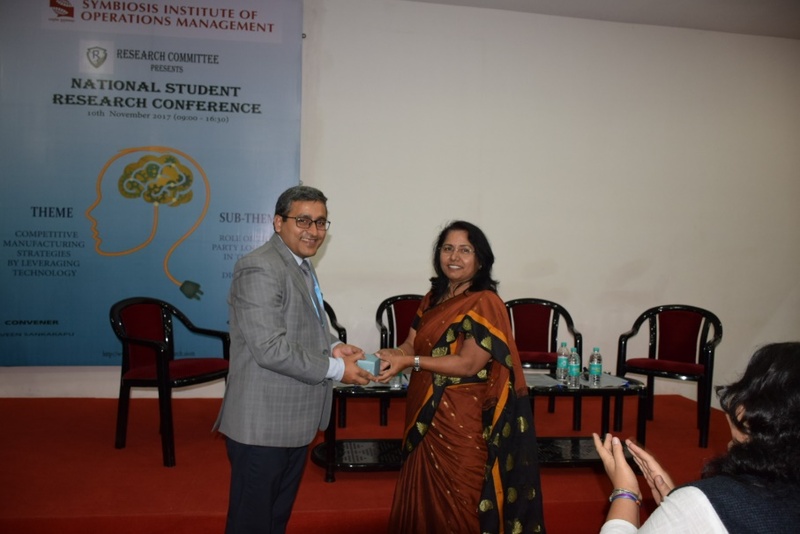 Dr. Vandana Sonwaney opening the conference by delivering welcome note to all the esteemed guests, delegates and students of SIOM. 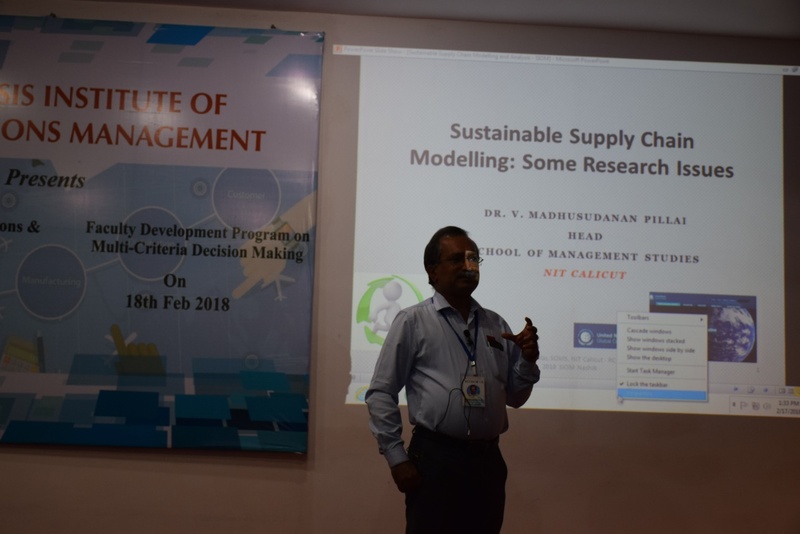 Dr. V. Madhusudanan Pillai delivering keynote on Sustainable Supply Chain Modelling research issues. Bio Medical Waste Management Processes and Practices adopted by select hospitals special reference to the Pune city. Importance of Quality assurance activities and quality management system in Supply chain. Method improvement in material (Bobbin and Finished Coils) loading and unloading time on Rope Machine to increase Machine Norm Run hours. Leveraging Technology to improve Mobility in Warehouse/Inventory Management. IMPACT OF COMMUNICATION TECHNOLOGIES ON SUPPLY CHAIN : A REVIEW OF LITERATURE. Warеhousing Stratеgy post GST by building a network optimiser. Financial Disruptions – What is the way forward ?